The Quick Firing (QF) 13 pounder was standard equipment for the British Royal Horse Artillery and the Royal Canadian Horse Artillery during the First World War. 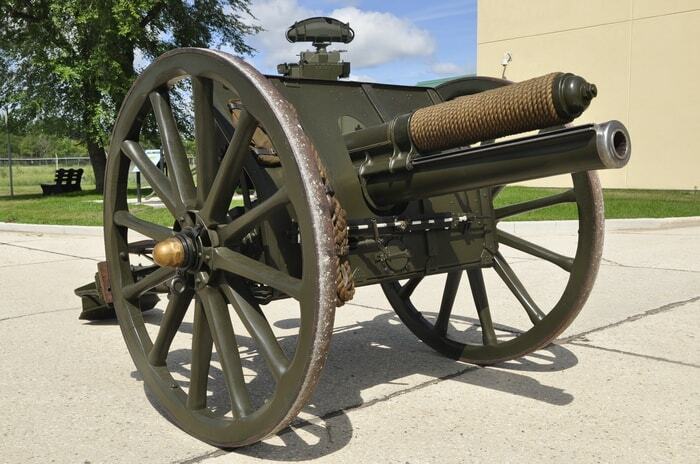 In 1906, Canadian units received the QF 13 pounder for the horse artillery and QF 18 pounder for the field artillery. 0n 23 September 1914, the RCHA embarked with twelve 13 pounders and 1,500 rounds per gun. The 13 pounder saw action on all fronts supporting cavalry brigades and was highly praised for its lethal effectiveness and mobility in open warfare, but proved less effective in trench warfare. By 1916, 13 pounders were being used as Anti-Aircraft guns. It was in service throughout the British Empire from 1904 to 1940.